I was probably the first Tench Fisher up at 4am and I spombed out more hemp (about 1pint) and half pint of dead red maggots the 52 yds. 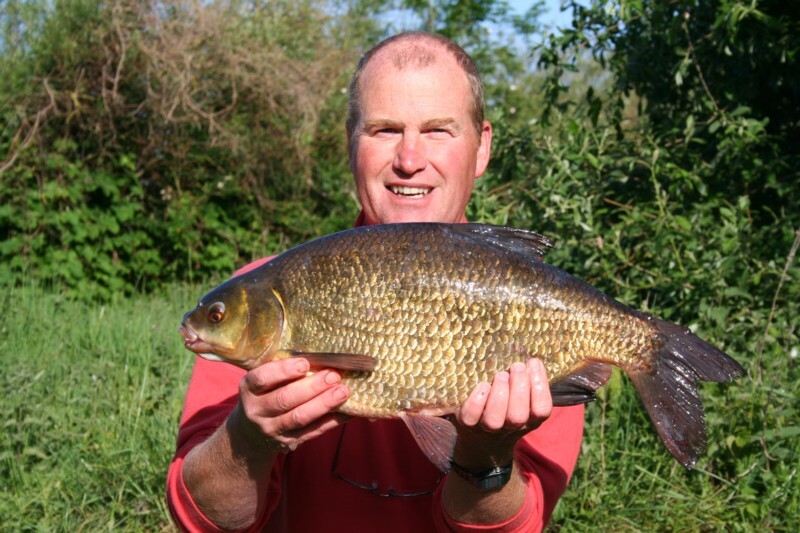 I say the first up, at 2am something daft time Andy caught a splendid 10lbs 8oz tench. Brilliant! The surface of the lake was still in the first light. Straight away the diving birds bless them were on the feed as no other anglers were feeding their swims. They must home in on the sound of the feed going into the water. Nothing much happened until 7pm when I had another good fish of 7lbs 3oz female, my photographer was not present in his swim so I had to slip the fish back. 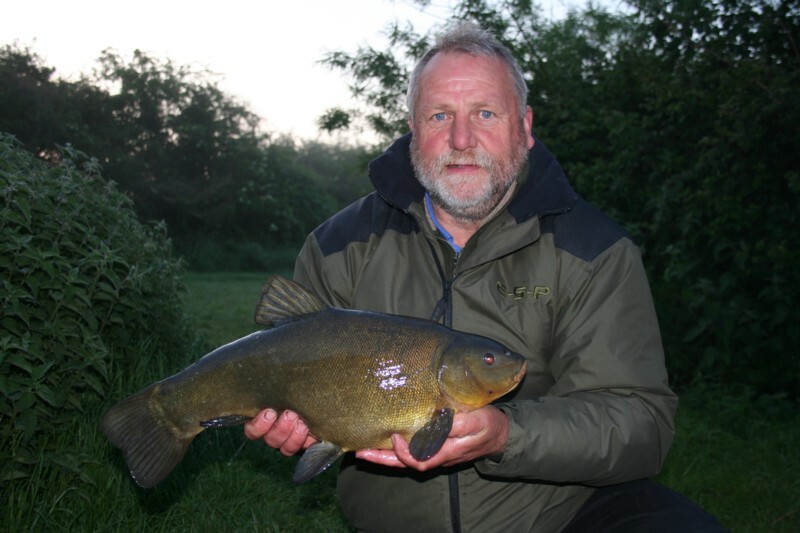 Then at 7.15am I had the smallest tench of 3lbs 5oz which was a male. The routine was to land the fish unhook it then keep it in the landing net to recover while I recast. I would then weigh take photo’s and then return the fish. The reason for recasting is that they are shoal fish I might just have another opportunity to get a run from another fish before they move on. 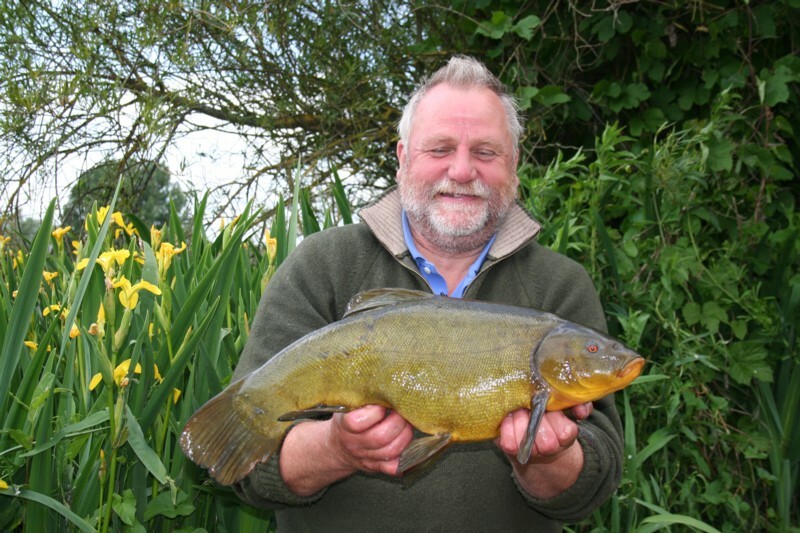 At 7.30am I had another tench which looked a good fish as she lay in the net. She was unhooked and slipped back in the net and water while I recast and got the weighing equipment and camera ready. As I got her out to weigh the rod was away again and as I was playing another fish. I called out to Paul who was in the next swim and he helped me land a small and my only bream from Horseshoe. The bream weighed 6lbs 11oz. 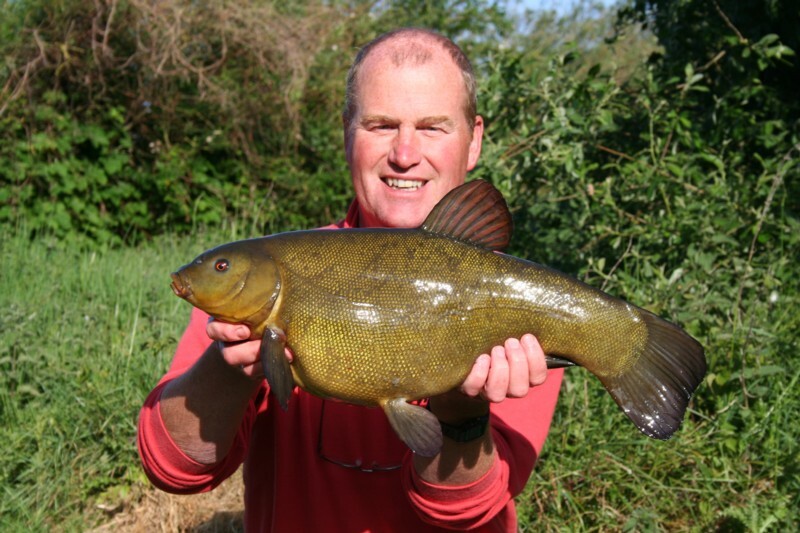 With the bream returned we decided to photo the tench. Pete Harding the Tench Fishers Chairman was passing and he did the honors. The tench was 8lbs 4oz. Paul had the unfortunate smell of the bream in his net. 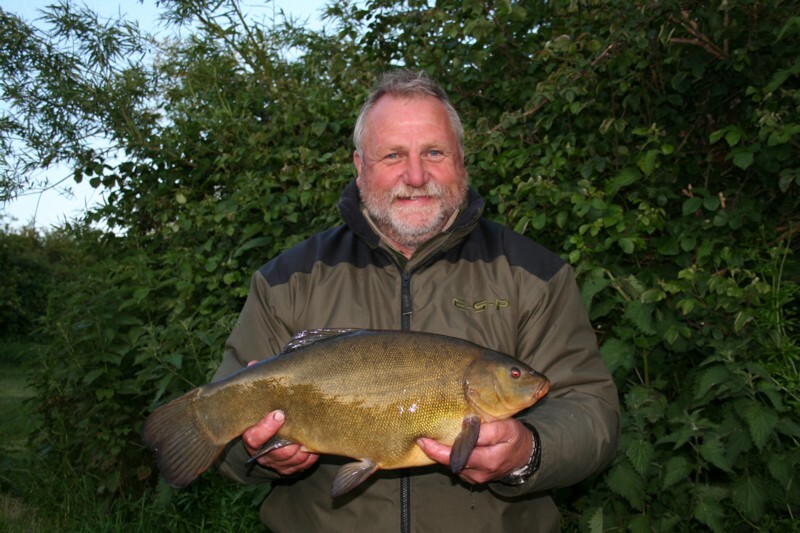 Then at 8.45pm the rod was away again this time a very nice female tench of 6lbs 15oz lay at the bottom of the net. 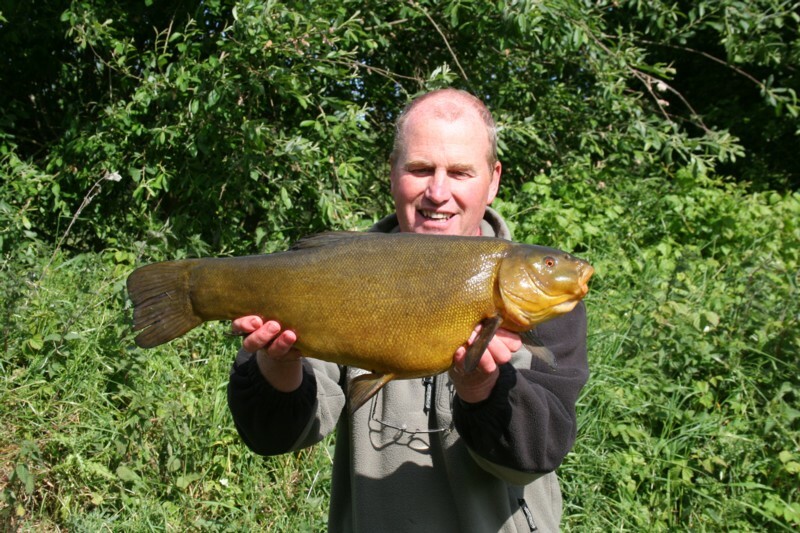 At 9.30 I had another tench this time the largest of the session at 8lbs 10oz. She gave me a good fight taking line to the left and right. By now Dave Rogerson had got me the bacon butties as I dare not leave the swim. What an Ace! Soon nothing else came along, so I needed to use the facilities around the other side of the lake. My need was such that I couldn’t stop and talk to many others. I could do this on my return journey when the urgency was gone!!!! I had said to Mick Butler to come and fish with me as the swim was producing and it was a double swim! He hadn’t caught and couldn’t find a clear patch. Mick is a great guy I had met him at Bradley’s last year in a fish-in. He originates from Cirencester and we have a good chat about the Cotswold Water park of old. I invited him to fish with me and that we could hit alternate runs. He was unsure, as I would have been. But when I mentioned I had a can and a half of beer left that did the trick. John had taken the Boat point which had the makings of the best catch of the session. 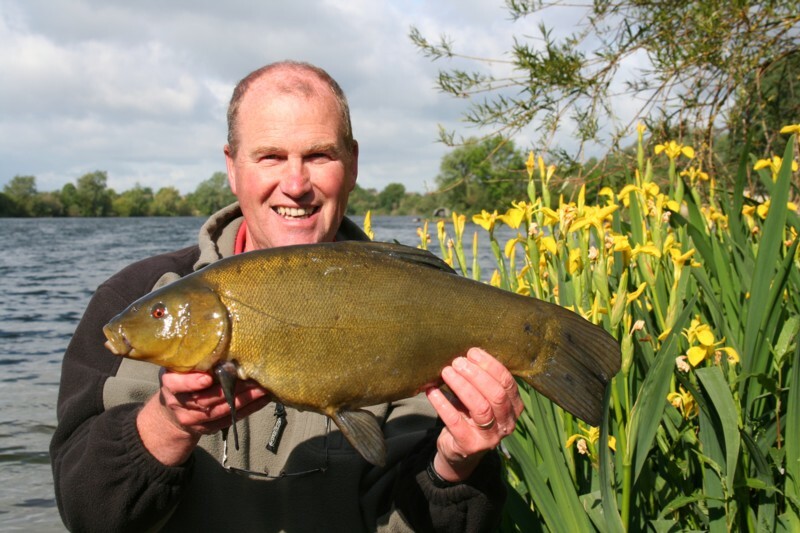 However John was unlucky as the tench were just not there. I as I returned to the swim I talked to so many people it took 2 hrs to return. Archie from Honiton, another Bradley fish-in session guy was struggling but he is a good fisherman and I guessed it wouldn’t be for long. He has this huge fridge that he takes with him which carries ????????? Well I don’t honestly know. I said that Mick and I would come through at 4pm to pick him up and walk to the hog roast. Mick turned up at 2pm ready to pitch camp. The wind was really blowing hard by now but I did feel confident. The time drifted by and Mick and I talked and talked. Soon it was 4pm, and time for the hog roast. We picked up Archie on our way and headed for the club house. Soon Archie, Mick, John and myself were sitting one a picnic table quaffing the beer and red wine and having gut busting laughter. the hog roast was a great success. Mark another Devon Tench Fisher joined us and listened to the stories and jokes. Mark is an ex match man, however his luck so far on Horseshoe had eluded him. Soon it was time to return to our swims, Mick told Archie and me the funniest joke ever about a boy who couldn’t stop swearing, too rude to be told here. We said goodbye and good luck to Archie and Mick and I returned to swim 53. I said to Mick he could hit the first run. And at 8.25 he did and a perfect 6lbs 12oz female graced his net. A couple of beers later and it was 10.30pm I was knackered, no old boy’s afternoon snooze for me. We were up a little later at 5am and a few spomb’s of hemp and maggot’s went the 52yds out. 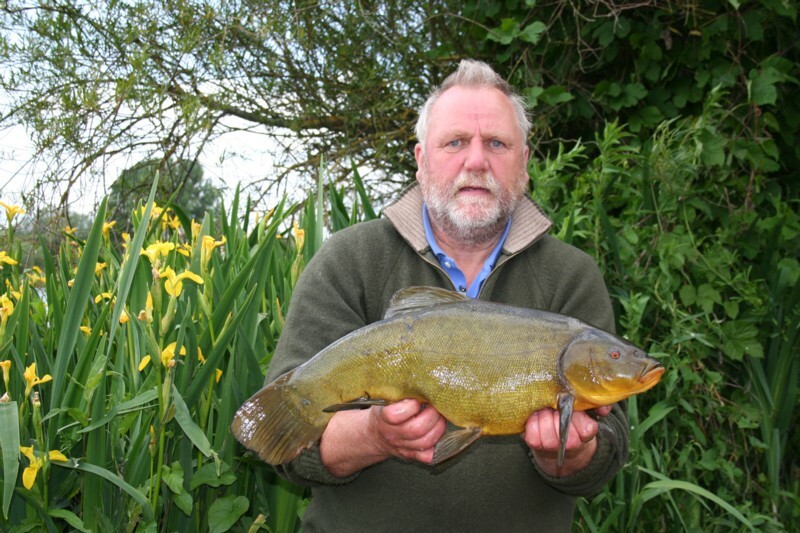 Mick had a nother large tench of 7lbs 7oz in his net. Then he had another at 6.30am , after we sat there going you hit it, no you hit it, no after you, while the alarm was screaming away. It was a 6lb female again. The mist was such that at times we couldn’t find the mark on the far bank to cast out. 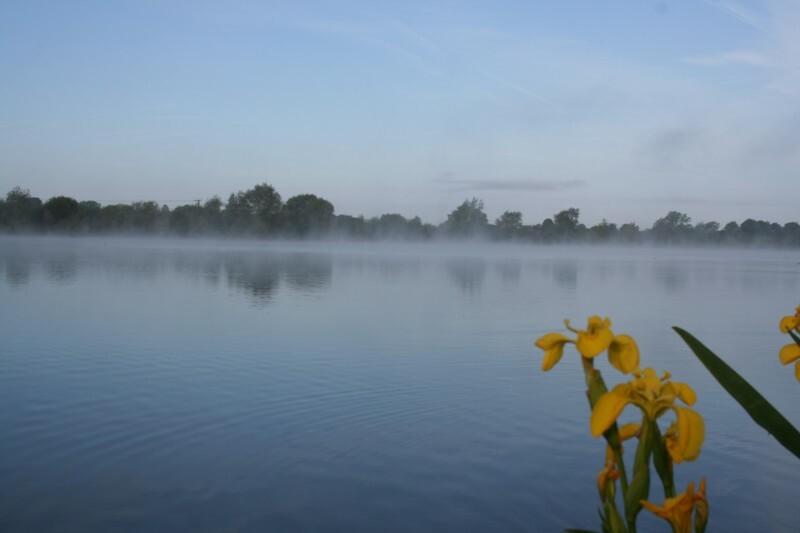 Then I had to use the facilities again and Mick wasted no time in getting another tench of 4lbs 11oz at 7.20am. Then at 8.52am I landed a nice male tench of 6lbs 9oz which lead me a very merry dance. Time was drifting by and we needed to be off the water by 3pm. Well Mick and I said 12.oo, then changed it 1pm then 1.30pm. Just as well really, as at 1.05pm one of my rods roared off and bloody hell I pushed Mick out of the way and reached the rod and played this fish for about 15 seconds before it snagged me in weed. I pulled, gave slack line, and Mick coached me all the way! Finally the hookhold gave and I reeled in a swim feeder and rubber maggots. We were just checking the terminal tackle when one of Mick’s rods was away. He almost upended me over the hedge in his efforts to get to the rod, and it turned out to be a splendid tench of exactly 8lbs. Begrudgingly I wetted my net and unhooking mat again for him to do the duty. It was a great looking fish and was the icing on the cake for Mick. That's much better Mick 8lbs of the jolly green giant. We then packed in for the session Mick had 5 tench and I had 10 tench which was great fishing! This entry was posted on Thursday, May 26th, 2011 at 8:38 pm	and is filed under Uncategorized. You can follow any responses to this entry through the RSS 2.0 feed. Both comments and pings are currently closed.